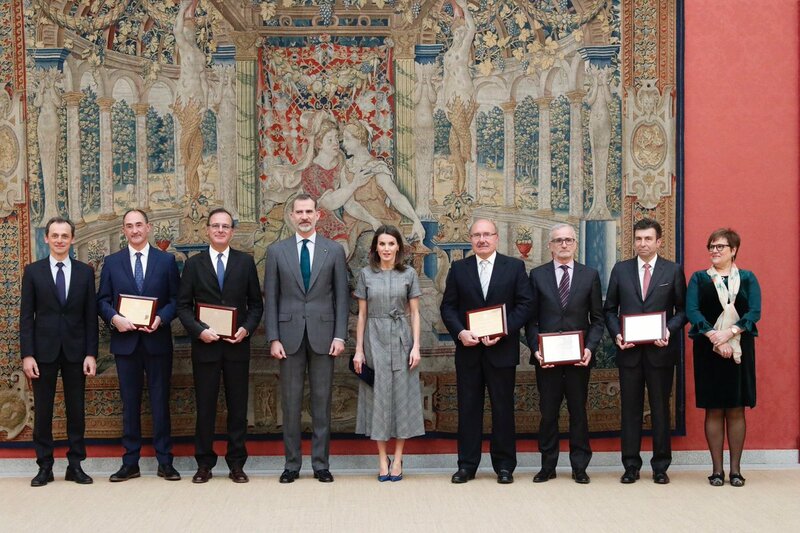 Today King Felipe and Queen Letizia of Spain presided over the National Investigation Prizes 2018 and presented awards to the scientists Rafael Rebolo, Ramón López de Mántaras, Pedro Jordano, Luis Liz Marzán and Pablo Artal at the Royal Palace of El Pardo in Madrid. 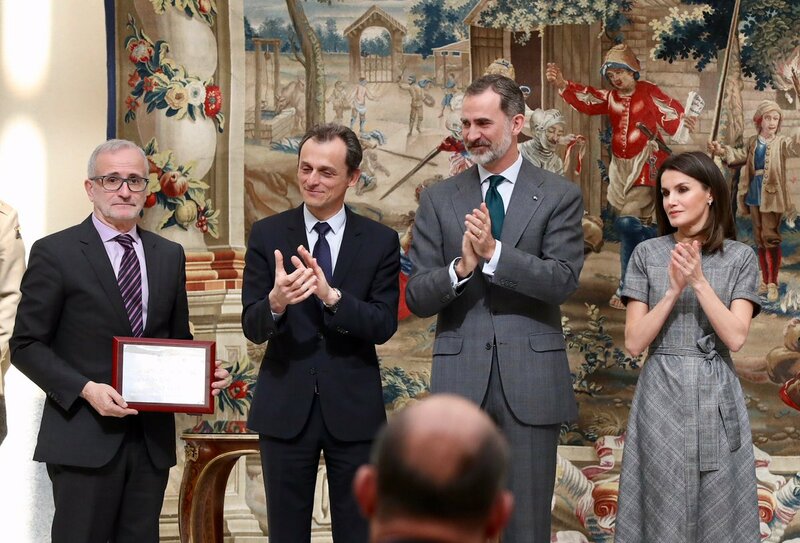 Since 1982, granted by the Ministry of Science, Innovation and Universities, these awards are the most important in the field of scientific research and recognize the work of Spanish scientists with outstanding work in their field. The King and Queen presenting the awards to the winners. This year awards were presented in 5 categories: National Prize “Blas Cabrera” of Physical Sciences, of the Materials and of the Earth, National Prize “Julio Rey Pastor” of Mathematics and Information and Communication Technologies, National Award “Alejandro Malaspina” of Natural Resources Sciences and Technologies, National Prize “Enrique Moles” of Science and Chemical Technology and National Award “Juan de la Cierva” of Technology Transfer. Felipe and Letizia with the winners after the ceremony. Queen Letizia wore a beautiful gray dress we have already seen in past. She was wearing Massimo Dutti Wool Check Dress With Belt that she first wore in December 2018 at the Princess Girona Foundation Meeting. 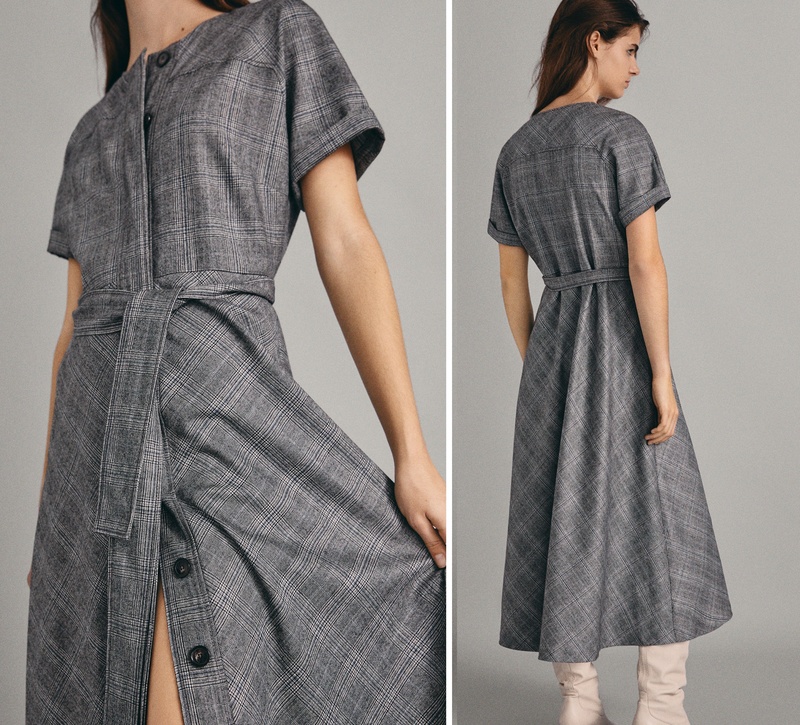 The Check dress made from 100% wool with a belt detail features an A-line silhouette, a round neckline, front button fastening concealed by a placket and short sleeves. A closer look at the € 99.95 dress. The dress is still available in all sizes at its online store. 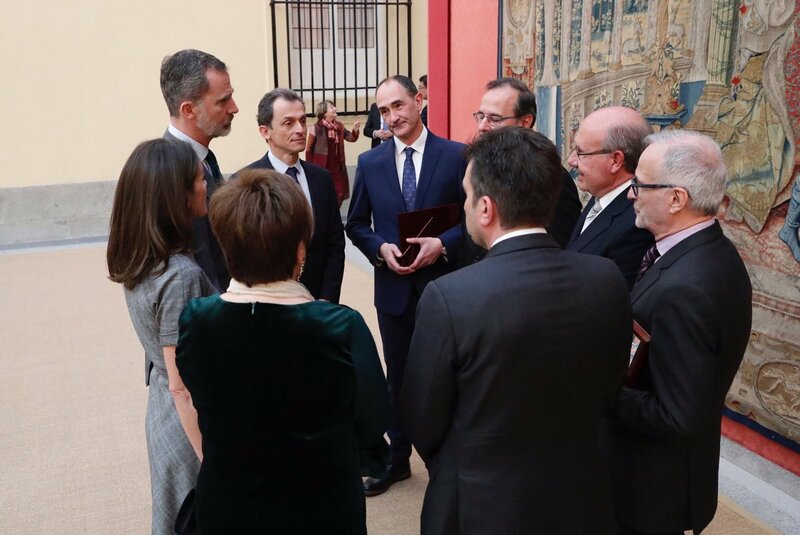 Keeping the exactly same as the last outing of the dress, Letizia paired her look with Magrit pumps that she first wore in April 2018 to welcome the President of Portugal. 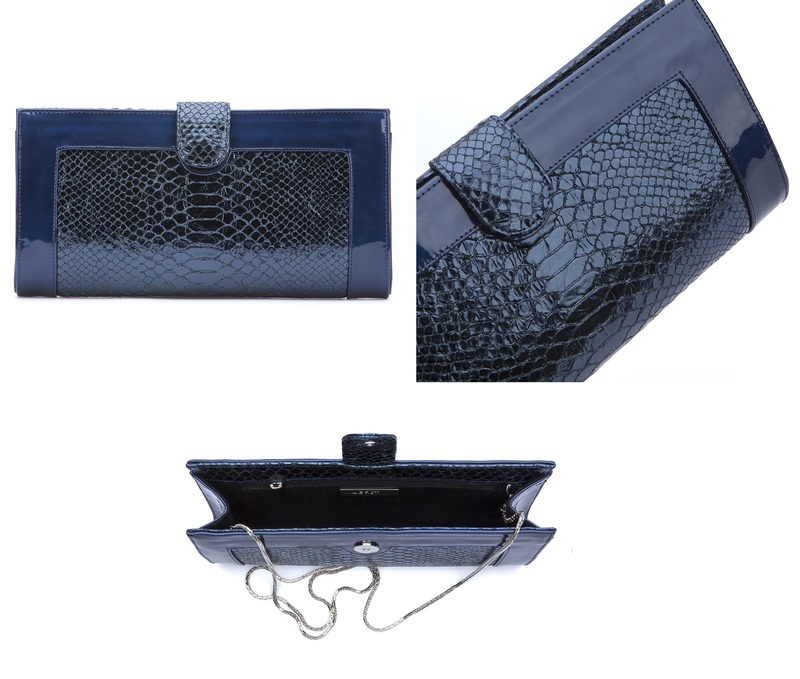 Letizia carried her Magrit Patent Leather Hawa Clutch also debuted in in April 2018 to welcome the President of Portugal. Letizia finished her look with Bvlgari Aquamarine earrings. Today she removed the stone and wore only the hoops. 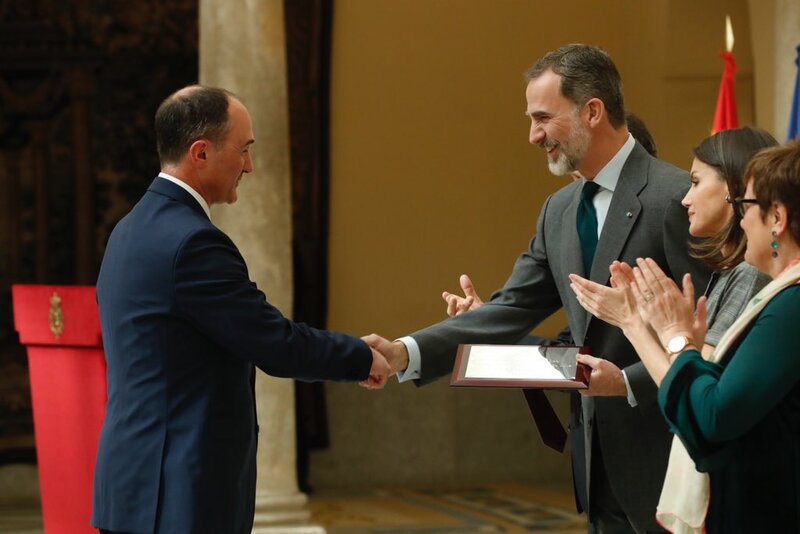 The earrings were gifted to her by the company on the birth of Princess of Asturias.